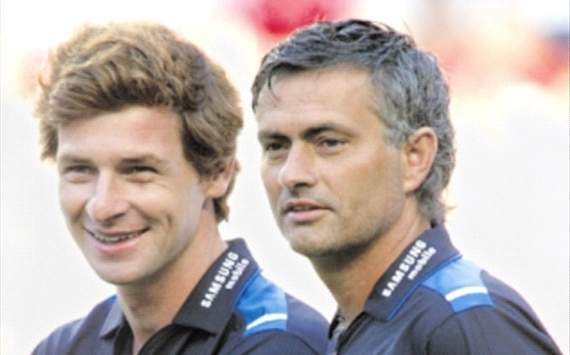 Tottenham manager Andre Villas-Boas has described Real Madrid boss Jose Mourinho as “the best coach of all time”. The 35-year-old worked as his compatriot’s assistant at Porto, Chelsea and Inter before beginning his own managerial career. And he has underlined the importance of the lessons he learnt under Mourinho, describing working alongside the Setubal-born boss as a “privilege”. “Mourinho is perhaps the best coach of all time”, he told Brazilian newspaper Lancenet. “[Working with Mourinho] was a unique experience. It’s difficult to find someone with so much professionalism, dedication and knowledge of the game. Villas-Boas was also keen to dismiss comparisons between himself and Mourinho, with both having tasted success with Porto before moving to Chelsea. “They’re made by people outside the game,” he added. The Spurs coach also hailed the impact of Sir Bobby Robson on his career, with the Englishman having helped him on his first steps into coaching during his time at Porto. “He lived in my building and I was a Porto fan,” he said. “So I started to talk to him about the players and he told me, very friendlily, that he’s let me come to the training sessions. That’s when my passion for the game and the tactics started. This entry was posted in Club news on 31/12/2012 by mirsinho.